The 10th Annual Scientific Meeting of the Irish Association of Physicists in Medicine will be held in March in Dublin. This year’s ASM will be held in Croke Park on Saturday March 23rd. The IAPM ASM organising committee are working hard to bring you an exciting and stimulating programme that builds on the success of previous years. Many thanks to our sponsors for their generous support for this event without which it would not be possible. Abstract submission is now closed. Click here to download the abstract submission guidelines. Click here to read the IEL Bursary guidelines. Dr. Jones is the Section Chief of Radiologic Physics in the Department of Imaging Physics at MD Anderson Cancer Center. His current clinical focus is on interventional and intraoperative imaging. He has authored over 50 peer-reviewed publications and been awarded grants for his research. In 2013, Dr. Jones received the Farrington Daniels Award for best paper on Radiation Dosimetry in Medical Physics, the journal of the American Association of Physicists in Medicine. Dr. Jones is currently leading the pilot phase of the ACR-SIR Fluoroscopy Dose Index Registry and he is the physics editor for the Journal of Vascular and Interventional Radiology. He has delivered numerous presentations as an invited speaker at national and international conferences. Dr. Jones is certified by the American Board of Radiology in Diagnostic Radiological Physics, the American Board of Imaging Informatics, and is a fellow of the American Association of Physicists in Medicine. Currently, head of the medical physics department at Konstantopoulio General Hospital of Athens, Greece (ESR Eurosafe Imaging 5 star hospital). 27 years of experience in Diagnostic and Interventional Radiology and Nuclear Medicine. International Atomic Energy Agency (IAEA) expert sent in more than 20 missions for the last 13 years. Participated in multiple European projects (ENEN+ project, Clinical DRLs project, BSS Transposition Project, ENETRAP III, Paediatric DRLs, EUTEMPE-RX, EMAN, SENTINEL, DOSEDATAMED II, DIMOND II and III). International Organization for Medical Physics (IOMP) Secretary General (SG) for the term 2015-2018 and 2018-2021, e Medical Physics World Newsletter and IOMP website chair for 2012-2015. Founder and Chair of the IOMP Women Subcommitte since 2015. EFOMP Chair of Communications and Publications Committee in 2012-2013 and EFOMP Projects Committee Chair for 2016-2017. Hellenic Association of Medical Physicists (HAMP) SG for 2010-2012 and HAMP President for 2012-2018. Member of Organizing, Scientific Committee, International Advisory Committee or chair of various international conferences. Editorial member of the European Journal of Medical physics (EJMP) and Medical Physics International. Section editor of the Hellenic Radiology Journal. Honorary Editor of IOMP eMPW. Member of the European Society of Radiology Radiation Protection Subcommittee. More than 120 publications in SCI journals and national and international journals or conference proceedings. More than 200 presentations and posters in national and international conferences. IOMP Fellow in 2016. International Day of Medical Physics Award 2017. Field of expertize: Patient and staff dosimetry, optimization, diagnostic reference levels, dose tracking software. Markus Buchgeister is a professor for medical radiation physics at the Beuth University for applied sciences at Berlin since 2010. From 1995 to 2010 he worked at radiation therapy department of the university clinic of Tübingen. At that time he also started teaching medical technical assistants at the local school of the university clinic, which he and hopefully his students enjoyed as well. Since 2003, he is engaged as co-opted board member for public relations and communications of the German Society for Medical Physics (DGMP). Parallel, he served as chairman of the EFOMP Communication and Publications Committee 2003-2009 and from 2009-2015 as German EFOMP delegate. In 2006 he relaunched the EFOMP European Medical Physics News (EMPNews) in electronic format and is on its editorial board since then. In 2017-2018 he was chairman of the EFOMP Education and Training Committee, being now its vice-chairman in 2019 and a German EFOMP delegate for a second round. His special interests are in modern educational techniques for medical physics as well as getting subjects of medical physics into teaching at schools. Michelle Leech is an Associate Professor and Head of department at the Discipline of Radiation Therapy, School of Medicine, Trinity College Dublin, Ireland. Michelle is Course Director of the BSc. (Honours) Radiation Therapy at Trinity College. She is immediate past Chair of the RTT (Radiation TherapisT) Committee within the European Society for Radiotherapy and Oncology (ESTRO). Within ESTRO, she is Chair of blended learning at the ESTRO School and is a member of the Educational Council. She is Editor-in Chief of the ESTRO Journal Technical Innovations and Patient Support in Radiation Oncology and is a member of the editorial board of `Radiotherapy and Oncology’. Michelle also contributes to activities of the International Atomic Energy Agency (IAEA), particularly in the education of RTTs. There is free parking on-site for all IAPM ASM delegates. A location map, travel details and details on parking are available here. The Conference Dinner will take place on Friday evening at 7pm in Wallace’s Asti. Tickets are limited and pre-booking is essential. 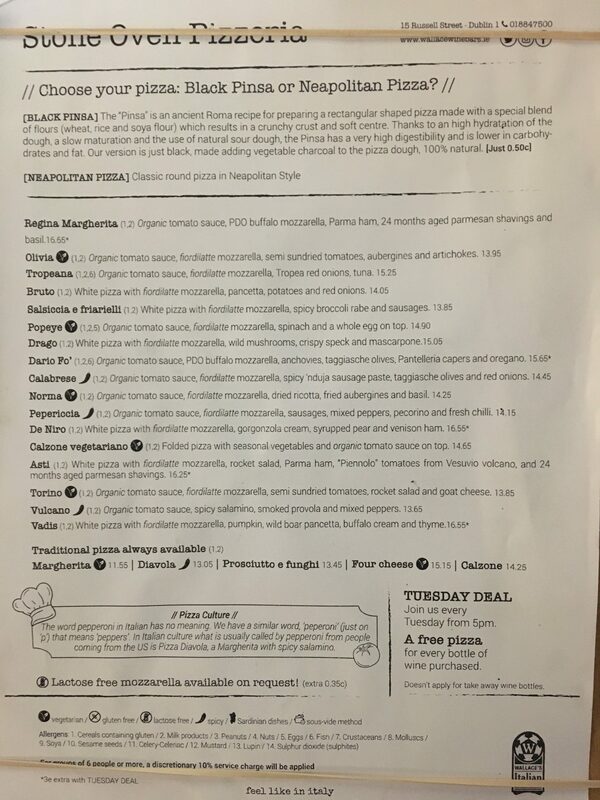 Please choose your meal in advance from this set menu (click here for pizza options). Your chosen option should be sent to editor@iapm.ie by March 8th. The Croke Park Hotel is directly across the road from Croke Park. The hotel have kindly offered the following delegate rate for IAPM ASM delegates: €149BB single occupancy or €179BB double/twin occupancy inclusive of full Irish breakfast, complimentary car parking and high speed Wi – Fi. To avail of these rates please phone the hotel on (01) 871 4444 and quote our special discount code: BOOK230319.